During a question and answer period at a spiri­tual convocation on the West Coast of the United States, a man stood up and asked, “What do you think of contemplative spirituality, spiritual formation, and meditation?” In some circles, these terms have become lightning rods; they engender heated discussions and sometimes more heat than light. There are those who believe that the Seventh-day Adventist Church has become cold, formal, legalistic, and spiritually lifeless; and its members desperately need to experience a fresh breath of spiritual newness. They are convinced that the way to reach postmoderns is through experience, not doctrine. To them, the answer lies in contemplative spirituality. For others, contemplative spirituality is no more than East­ern mysticism clothed in Christian terms—the devil’s deception. This group believes that contemplative spirituality leads unsuspecting church members into a counterfeit religious experience based on sub­jective feelings and emotions rather than scriptural truth. This entire issue leads us to some vitally important questions. What is Christian meditation? How does the Bible define it and how does it differ from Eastern mysticism? What are contemplative and centering prayers? Are there dangers in these approaches to prayer? Is the con­cept of spiritual formation biblical? Where can we find answers for the Laodicean complacency, spiritual barrenness, and cold formality com­mon in too many of our lives? Throughout Scripture, meditation stays always active, never passive, and always has an object. 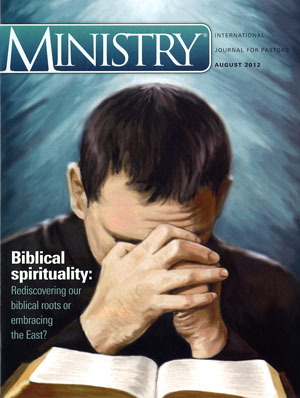 The goal of Christian meditation comprises filling the mind with the Word and works of God. Meditating upon His great­ness and matchless love, we are changed into His image (2 Cor. 3:18). In Christian meditation, we look out of ourselves to Him. Jesus is the object of our thoughts, the supreme focus of our attention (Isa. 45:22; Heb. 12:1, 2). We recognize that the heart is deceitful above all things, desperately wicked, and that in us there is no good thing (Jer. 17:9; Isa. 53:6; Rom. 7:18). Our hope is in Him. Our mind is fixed upon Him. Our attention is focused upon Him, and when meditating upon Him, we are transformed into His likeness (Col. 3:1, 2). The psalmist speaks of meditating on God’s Word, His law, His testimonies, and His works (Ps. 119:97, 99, 104). He also meditates upon God’s precepts and contemplates His ways (Ps. 119:15). Christian meditation thus focuses our thoughts on the grandeur and greatness of God, lifting us from what is around us and within us to what is above us. Another concept that has gen­erated a great deal of discussion is spiritual formation. Words have meaning in the way they are defined and who defines them. Is the con­cept of spiritual formation biblical? If we define spiritual formation as being formed into the image of Christ as we meditate upon God’s Word, seek Him in prayer, and open our minds to the transforming power of the Holy Spirit, certainly it is biblical. The apostle Paul admon­ishes believers at Rome “not [to] be conformed to this world but [to] be transformed by the renew­ing of your mind” (Rom. 12:2). Adventism’s uniqueness lies in our understanding of the great con­troversy between Christ and Satan. In contrast to an ever-deepening knowl­edge of Christ through His Word and an ever-closer relationship with Him, Satan will offer a counterfeit spiritual experience. Seventh-day Adventists believe that in the final conflict over the law of God, His people, saved by His grace, and transformed by His love, will reveal His compassionate character before a waiting world and watching universe. God will have an end-time people who desire to be like the One they most admire, a people who long for something much deeper than a mystical experience based on subjective feelings, on the one hand, or cold, legalistic formalism based on an intellectual assent to doctrinal truth, on the other. The words of the apostle John will beat fervently in their hearts, “Beloved, now are we the children of God, and it has not yet been revealed what we shall be, but we know that when He is revealed, we shall be like Him, for we shall see Him as He is” (1 John 3:2). 1 Ellen G. White, Conflict and Courage (Washington, DC: Review and Herald Pub. Assn., 1970), 28.